I&apos;m back from five glorious days in Virginia&apos;s Roanoke Valley and the beautiful Allegheny Mountains. I&apos;ll be sharing more about my great visit to Virginia in future posts, but let&apos;s get to what I enjoy most while on vacation: eating. I love indulging in food on my vacation, and let&apos;s just say that I don&apos;t worry about calories. I sip, savor, and soak in the atmosphere in every place I visit. In fact, years later, I will recall some of my best vacation memories by the food I experienced. Yes, I&apos;m working hard this week to drop a few pounds after a lot of eating and drinking, but all of the calories were SO WORTH IT. Indulging in mouth-watering cheesecake will be one of those vacation memories for me. 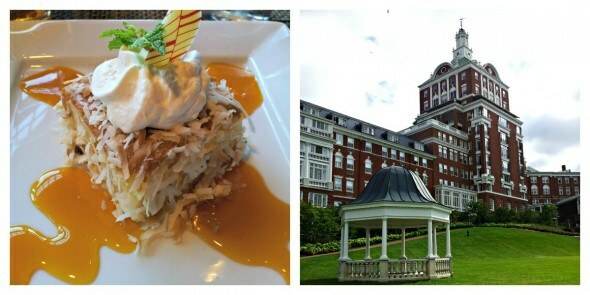 We enjoyed desserts on the terrace at the Hotel Roanoke in Roanoke, Virginia, on our last night in the city. In all honesty, the time on that terrace as a family was a trip highlight. My son and I shared the cheesecake, and my daughter, the same son, and husband shared a decadent brownie. We were tired from a day of sightseeing, but it was still too early to retire to the room. Desserts on the terrace made the perfect ending to a busy day. 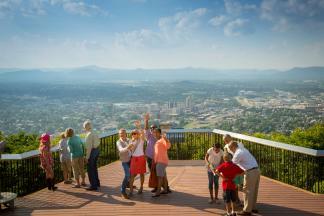 I could not have asked for a more perfect evening overlooking the enchanting Roanoke Star. At Roanoke&apos;s farmer&apos;s market, which happens to be right in the middle of town daily, I took the time to sample local Virginia wines. Nearby Fincastle Wines were in the spotlight on this day. Every glass I tasted made me want to buy a bottle, and to finish the tasting with the winery&apos;s Sangria hit the spot. While dining, I always ordered Virginia&apos;s own craft brews. I discovered a beer from Devil&apos;s Backbone Brewing Company, which is located in Roseland, Virginia. I am in love with the Vienna Lager. I don&apos;t know if their beer is sold North Carolina, but if I can&apos;t find it at one of my local retailers I am going to beg them to carry the Vienna Lager. I was so impressed with the downtown Roanoke dining scene. There were so many restaurants within walking distance of the Hotel Roanoke. On our last night in the city, we enjoyed a New Orleans-style restaurant called The Quarter. The courtyard dining area was just what the doctor ordered after a busy day of sightseeing. The cool air was refreshing, and, truthfully, nothing beats al-fresco dining. Talk about an authentic cajun restaurant! They even served gator bites, which I could not muster up the courage to try. 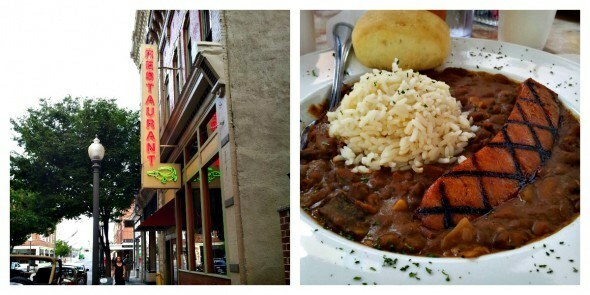 But the red beans and rice with andouille sausage heated up my evening just fine without my trying alligator. The restaurant had a great children&apos;s menu, too. I think I would go back to Roanoke for the dining scene alone. 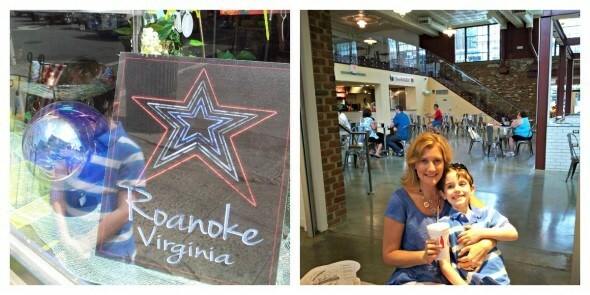 Roanoke renovated the historic city market building, and it&apos;s filled with local eateries. We, of course, had a break there after visiting the Virginia Museum of Transportation, which is home to the largest diesel and steam locomotives in the United States. I think you&apos;re learning that I&apos;m a lazy sightseer and spend a good portion of my day eating. The city market building was a great place to enjoy a quick bite, or a drink in the heart of downtown. This is how I live life to the fullest on vacation, and I didn&apos;t hesitate one bit eating this rich, but delightfully refreshing dessert either. The Toasted Coconut Sponge Cake at the Casino Restaurant at The Homestead Resort in Hot Springs, Virginia was delicious. With five restaurants on property, finding a great dessert was effortless. My kids would argue that the ice cream at the Homestead Resort was the best. And being the good parent that I am, I let them indulge every night. After all, this is their vacation, too. I&apos;ll have more on this area soon. I did do some things besides eating. Promise!